He and welcome to Dr. Francois Major’s laboratory at the Institute for Research in Immunology and Cancer, and Computer Science Department, University of Montreal. Note: If you are looking for the Supplemental Information of our publications, go to Publications. In this lab in the long-terms, we want to understand and characterize human gene regulatory networks; link cell content to phenotypes; and, design and create artificial molecular components to peek and poke cell information and programmes. 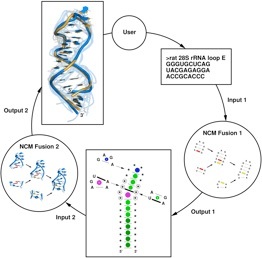 We are developing a suite of programs to analyze, model, predict, and determine RNA 2D and 3D structure. You can access and download our software through the MC-Tools page. You can also access Web services of most of our programs through the MC-Pipeline page. Septembre 13 2016 – Genome Canada and Canadian Institutes of Health Research – 16 canadian projects canadiens in bioinformatcs and computational biology (B/CB) were approved for financing, including our project “Computation of cell-specific microRNA::Mrna regulatory networks enables the design of efficient RNAi-based therapeutics”, which received $250,000 over two years.